Two fixed doubles in seperate cabins with built in wardrobe/drawer unit. A great choice for two couples. Cruiser stern. 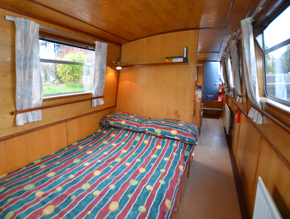 Two fixed double beds in separate cabins with built in wardrobes/drawers. Raised seating in the saloon. Large galley. Radio cassette and TV. Shaver socket and charger socket for mobile phone/video camera power packs. All pillows, duvets and bed linen supplied. The large shower has a high pressure shower unit and there are china, fresh-water flush toilets. 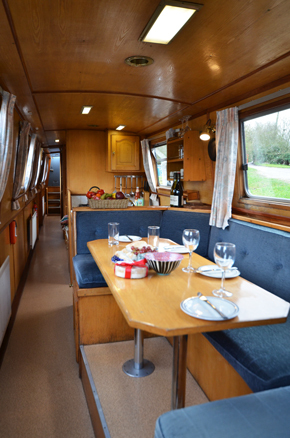 All boats from the Brewood base have a beam of 6′ 10″ and at least 6′ 2″ of cabin headroom. They carry sufficient gas and diesel fuel for a three week cruise and are fitted with 100 gallon fresh water tanks. 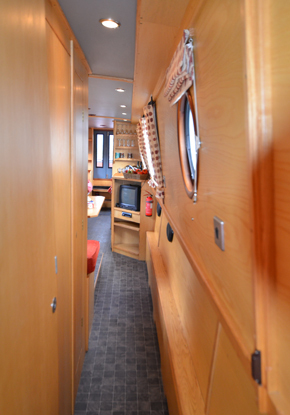 Each has a “quiet” engine and full gas central heating systems provide comfort throughout the cruising season. There is extensive use of hardwoods and matching oak and ash veneers, teamed with carefully co-ordinated soft furnishings to create light, airy interiors. Sleeping cabins have full-length wardrobes and further storage by way of built in cupboard and/or drawer units. All beds are fitted with high-quality, sprung mattresses. All berths are a minimum of 6′ 3″ in length and all bed linen is supplied. All galleys are well-equipped and have a domestic size, 4 burner gas cooker with a large oven and grill, 3 cu. ft. electric fridge with full width freezer compartment, cafetiere. A full range of matching crockery and cutlery is provided together with and extensive selection of quality utensils and kitchen ware.